December 28, 2017, 2:00 p.m.
2017 was a good year – at least for Republicans. In the latest Economist/YouGov Poll, 43% of Americans describe the past year as a good year for the world, up 14 points from what the public said at the end of 2016. However, that improvement is mostly the result of a GOP turn from negative to positive – today, two-thirds of Republicans say that 2017 was a good year. 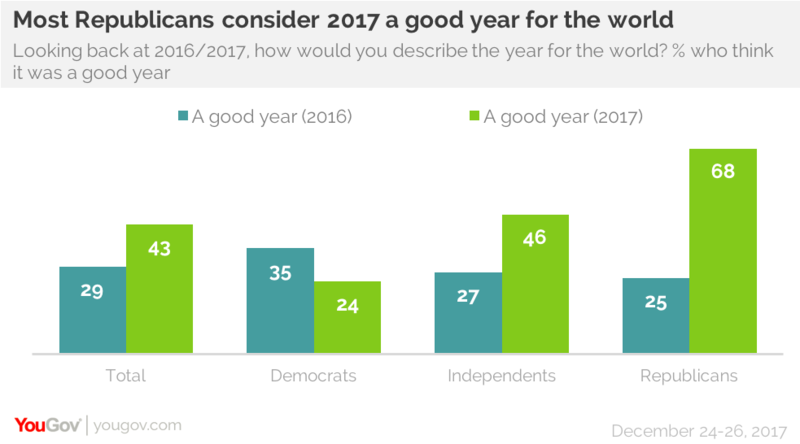 Last year, just 25% of Republicans believed 2016 was a good year for the world. 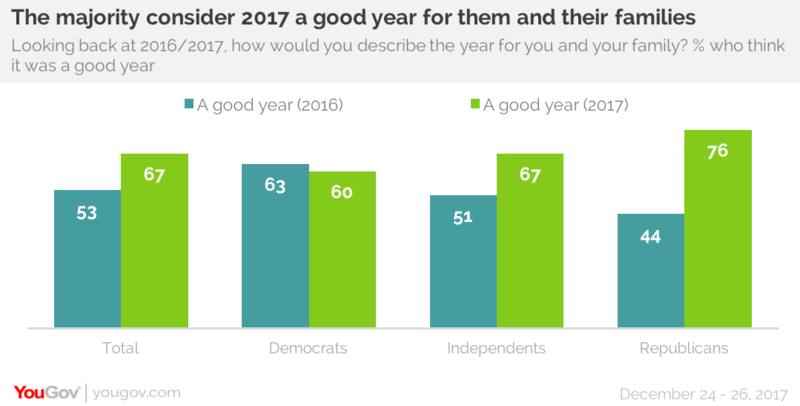 Independents also feel better about 2017 than they did about 2016; Democrats feel somewhat worse. Last year, only 8% of Republicans said the United States had become more respected in the world in 2016. As for 2017, 48% of Republicans believe the country has become more respected. 80% of Democrats say it has become less respected. 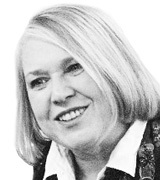 Of course, much of the difference is due to the change in Administrations in Washington, and the replacement of Democratic President Barack Obama by Republican President Donald Trump. The partisan difference extends to the assessment of how 2017 has treated one’s own family. Last year, a majority of Republicans said that 2016 had been a bad year for themselves and for their families. This year, three-quarters of Republicans say the past year has been good for themselves and their loved ones. As for Democrats, their assessment of how the past year has been for their families is about the same as the way they rated 2016 last December. One area where Republicans and Democrats agree is how they view the state of American political discussion – it has become much more negative in the last few years. This year, 66% say political discussion had become more negative in 2017. Last year, 59% said that about 2016, and in 2015, 55% said the same. That doesn’t mean that politics has become more interesting. Only 27% think that, which is a few points lower than the 32% who said so in 2016 and 2015. As for the President himself, his approval rating during his first year in office has never risen above 43% in the Economist/YouGov Poll, and has not been above 40% in the last few months. 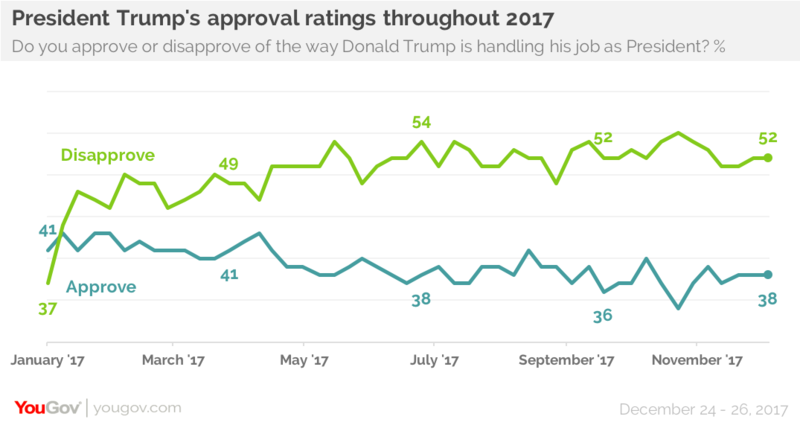 This week, at the end of 2017, 38% approve, while 52% disapprove. Disapproval has increased since the beginning of the Trump Administration. The President has generally met the public’s expectations for his first year in office, though just 23% say he has accomplished more than they expected of him. 29% say he has accomplished less than they expected. On specifics, many Americans are still waiting. Even though the tax cut bill just became law, only 49% say he has kept his promise to cut taxes. Even fewer, 31%, say his actions have succeeded in repealing Obamacare. Looking ahead to how Americans expect history will judge Donald Trump as President, less than a third say he will be viewed as outstanding or above average, something two-thirds of Republicans believe will be the case. 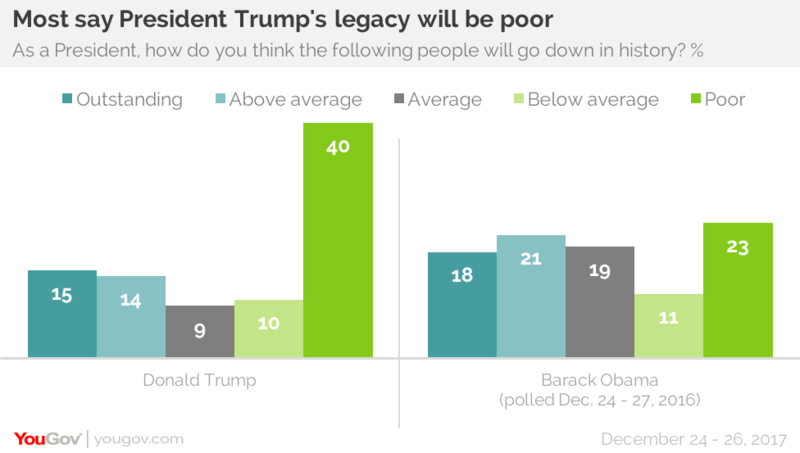 Half think the Trump Presidency will be seen as below average or even worse – 40% think he will be regarded as a “poor” president. Assessment of President Obama near the end of his second term was slightly better, but like the public’s current judgment of President Trump, it was also partisan. At the end of 2016, 49% of Republicans thought President Obama’s performance would be regarded by history as poor. Now, 71% of Democrats say Donald Trump will be regarded as a poor President. In fact, many think that President Trump will be a one-term President. Half the public, including 44% of Republicans, do not think he will be elected to a second term in 2020. 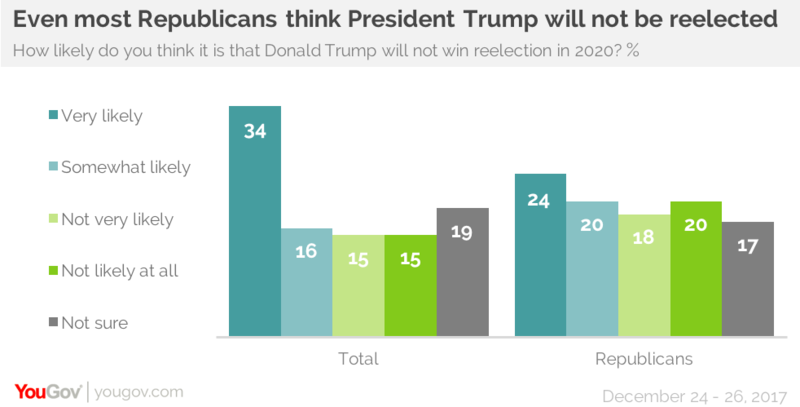 But despite GOP skepticism about what will happen in the 2020 election, two-thirds of Republicans still want the President to run for re-election then.